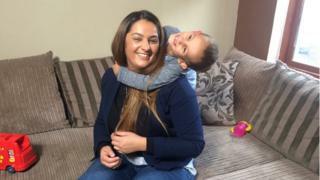 Image caption Kareema Motala says Jayden is "as loving and happy as you could get"
A mother has called for an independent investigation into her son's care at a special needs school in east London. Jayden, seven, has Lowe Syndrome, which makes him likely to injure himself. Kareema Motala claims Stephen Hawking School's care was lacking as since leaving his injuries have lessened. The school disputes the claims and has conducted its own internal investigation which Tower Hamlets Council said was "sufficient". Jayden has poor vision, epilepsy, rickets, a blood disorder and autistic traits. He cannot speak and has had more than 200 hospital admissions. According to Tower Hamlets Council he is also prone to self-harm and falls over regularly. "Jayden is more likely than other children to bump into things. Where rickets is present, fractures may occur with even minor injuries," the council said in a court document. "Jayden has a mild platelet disorder, which can result in easy bruising." Ms Motala said: "He's absolutely fearless - he has no concept of heights. He will happily hang off the sofa and he climbs constantly. It's very difficult to deal with." The mother claims on one occasion the child was left unsupervised on a see-saw, during which time she says he split his chin on the handle. Ms Motala also claims he was only issued with a protective helmet after his injuries became severe. "He was coming home with various bruises, his chin was split, and it just escalated," she said. "He has the capacity to cause himself and other children damage and my concerns weren't taken seriously." The mother also alleges a failure to change Jayden regularly, leading to damaged skin. The school has not corresponded directly with the BBC. However, in a statement on its website, head teacher Matthew Rayner wrote: "I would like to personally reassure [parents] that the comfort, consideration and safety of all our pupils is our overriding priority." Ms Motala's complaint about the school was investigated by a staff member whose review was then signed off by school governors. A review of school procedures was subsequently carried out by a former member of staff. "Essentially, there was no independent investigation. I had concerns about the school and I was knocked back every time," Ms Motala said. "I went to every agency, anyone you can think of meant to protect the public, and they just kept saying it's not our remit." A Tower Hamlets Council spokeswoman, speaking on behalf of the school, said: " ...these cases can be complex. The governors at Stephen Hawking School have already considered this complaint and were satisfied with their care. "There is no further evidence to warrant the council commissioning an investigation." Ms Motala said the situation was made worse by shortcomings surrounding the council inquiry, which considered whether she was responsible for the injuries. The council statement to the Family Court conceded: "The evidence does not support a finding that the mother has inflicted any of the injuries. "There have been no further concerns about the mother's care since the instigation of proceedings." "It was unbelievable," she said. "I was made to feel like a criminal." The council said: "We take the safety of children very seriously and have a duty to investigate injuries." The notes of an alcoholic woman were also confused with her file accidentally and - despite being exonerated - she says she has been unable to amend Jayden's Child Protection Medical to remove any suggestion his injuries were caused by her. "Every time I got to hospital I feel I have to defend myself," she said. The council has admitted things could have been done better. "There have been shortcomings around communication and process in the way that we handled this case and we have apologised to Ms Motala for that," the spokeswoman for the council said. "We have invited her to meet us so we can address her complaints." Lorraine Thomas, founder of the Lowe Syndrome Trust, said: "There is so much involved with Lowe Syndrome it's difficult for anyone to apprehend it straight away. "You've got to hold on to them at all times, make sure they're safe. "Risk assessments are pages and pages and pages."